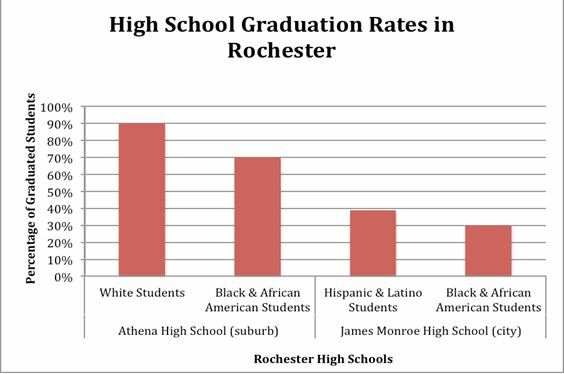 Minority students in Rochester may be at a disadvantage for high school graduation, according to the 2010-2011 New York State Report Card. Rochester Superintendent Bolgen Vargas ran on a platform of collaboration, communication and raising high school graduation rates. And while high school graduation rates are rising in Rochester, as well as nationwide, Vargas says there’s still a lot of work to be done, especially for minority students. Vargas himself was a minority student, and attended high school in New York, where he only spoke Spanish. Vargas beat the odds and graduated high school, but other minority students may not be as lucky. The “Building a Grad Nation” report, which was published in February, cites rising graduation rates for most high school students, but not all. Minority students’ graduation rates lag “well behind their white peers,” and students with a limited grasp on the English language lagged even farther behind. A quick comparison of urban and suburban schools showed that Pittsford-Mendon High School, a suburban school, had a graduation rate of 100 percent in the 2010-2011 school year, while James Monroe High School, located in the city, had a graduation rate of only 36 percent during the same year. Pittsford-Mendon High School is composed of 89 percent white students, while James Monroe High School is composed of 34 percent Black or African American students, and 59 percent Hispanic or Latino students. James Monroe’s high school graduation rates from 2011 show that for minority students, only one out of every 3 students graduates. The disparity between graduation rates of different ethnicities is also apparent in suburban schools. Athena High School, located in the Greece Central School District, is a high school well known for academic success. That success however, is not evenly distributed among its students. White students make up 80 percent of the student population, and enjoy a 90 percent graduation rate. Black and African American students make up 14 percent of the student population, and only have a 70 percent graduation rate, a percentage that falls under the Adequate Yearly Progress (AYP) percentage. If students are able to beat the odds and graduate from high school, they face new challenges in college. Like Jones, many students struggle with math and science, and are forced to play catch-up with difficult subjects in college. Assistant Vice President of Rochester Institute of Technology’s Student Learning, Support and Assessment Office Dr. Nicole Boulais said in an email interview that many students seek assistance not only in math and science, but also with developing study skills. “These skills range from time management and organization skills, to goal setting and motivation, to more specific areas such as managing test anxiety or note-taking techniques.” Dr. Boulais also advised students preparing for college to know their strengths and weaknesses, and to understand their habits and motivations. About the Author: Yasmeen Smalley is a recent graduate of Rochester Institute of Technology and is a professional blogger. She has had articles featured on Democrat and Chronicle’s Flavor blog, as well as City Newspaper‘s college blog. Her passions include scuba diving and underwater photography. Her work can be found online at www.yasmeensmalley.com or via Twitter: @yasmeensmalley.